By now, you'll know that I did a segment on a local TV station (KSL Studio 5) featuring Anthropologie-inspired wall decor I made for my home. I made three decor pieces for the show, but I think the framed vintage paper flowers are my favorite. Want to make something like this for your home? It's really easy, I promise! Get ready to roll some paper and let's get started! Start with the Cricut Flower Shoppe digital image set or cartridge (depending on what version of the Cricut you have) and cut out at least 30 flowers. I used 36 flowers in my frame, all cut at the same size (11" x 11"). Helpful hint: Use double-sided pattern paper so your flowers have a fun design on the inside and the outside. 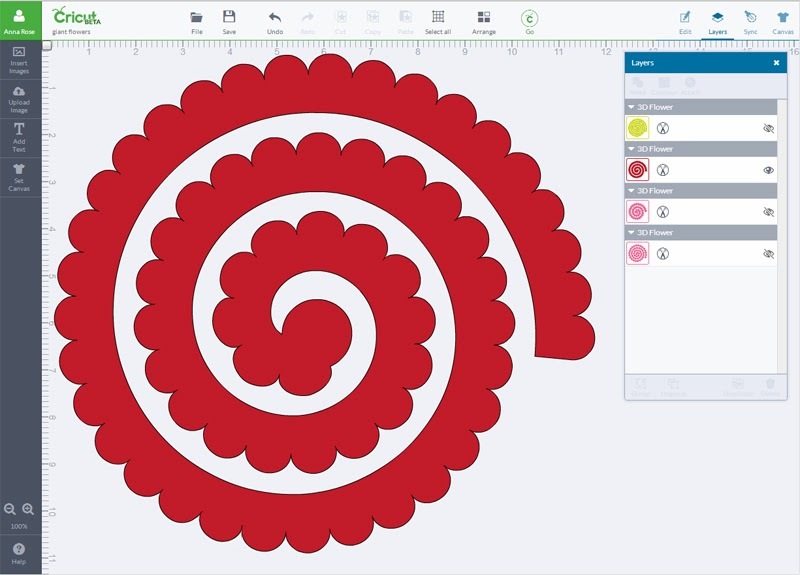 This shows one of the Flower Shoppe images in the new Cricut Design Software! Don't have a Cricut? Follow my instructions for a felt rosette and cut the paper out by hand. It's the same idea. Once all of your spiral pieces are cut out, use a hot glue gun to secure the center piece. Dab a little hot glue on the end and fold over a few times before you start rolling. Hold onto the center and begin rolling the spiral up, keeping the bottom edge matched up. Keep rolling until you reach the circle base piece at the end of the spiral. If you want the flower to look like a bud, glue it in place now. If you want your flower to be fuller, hold the flower in your hand and let it gently unroll. When the flower is the desired size, put a generous amount of hot glue on the circle base at the end of the spiral and set the flower in place. Rolling all of the flowers took me about two movies (3-4 hours). 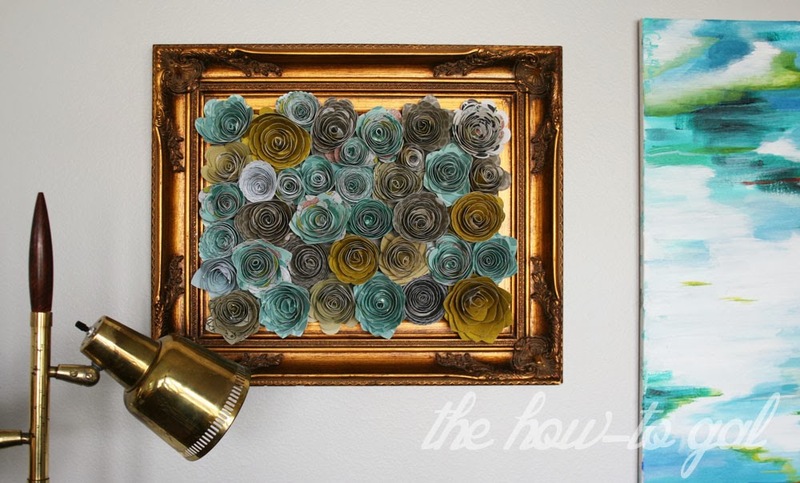 When all of your flowers are ready, start to arrange them in place on an old frame. I used a framed canvas I found at a thrift store. I covered the existing painting with a few sheets of scrapbook paper and then glued the flowers right to the painting. Squish the flowers together to create a nice effect. Be sure to use different papers and flowers to give the piece depth and variety. I just want to verify, you used the Flower Shoppe image or Giant Flower? The product description makes me think it's the giant flower image for the rolled flowers, or is it both? JeLe- I used the Flower Shoppe image set to make the rolled flowers, but the discount code also works for the Giant Flower image set. Both are amazing and would work for this project (which is why I listed both) :) Hope this helps! I am in love with this!!! The colors you used would match my living room perfectly! I don't own a cricut - any suggestions? Tristy, no worries! Before I had my Cricut, I simply cut a circle (or scalloped circle) by hand and cut it into a spiral. I have similar instructions for a felt rosette I made pre-Cricut. It's bascially the same idea. Thanks you soooo much for sharing this. It is so beautiful! I made it with a larger frame so it ended up being 85 flowers. Good thing my cricut held up. I love how it turned out. Ann, I bet it looks beautiful! Send pics my way!! I absolutely love this! Since I don't have a cricut, I read your tutorial about making flowers with felt. Do you suggest using felt or paper with this project? I know i'm not the blog author and it's a bit later and you've asked, but I'm making this now using pale dyed coffee filter roses. It's turning out great!